Rich in history, titles, legendary figures and fan base, AEK are one of Greece's top four clubs. They are based in Athens, but their roots are traced back to Greeks living in Constantinople (as Istanbul is called in Greek), before the two countries, Greece and Turkey, exchanged large numbers of population in 1922. 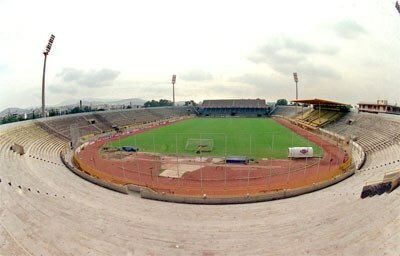 AEK's legendary Nikos Goumas Stadium. AEK (Athlitikί Énosis Konstantinoupόleos) were founded in 1924, soon after hundreds of thousands of Greeks previously living in Istanbul and other parts of today's Turkey, were forced to move to Greece. Athens were a big number of those settled down, and AEK, Athlitiki Enosis Konstantinoupoleos (Athletic Union of Constantinople) were founded exactly by refugees. The Byzantine Empire's double-headed eagle was chosen as a symbol, and yellow/black as the club's colors, practically identical to the flag of the Greek Orthodox Church, the headquarters of which remain in Istanbul. In Greece, “Ένωση”, (pronounced enosi, Greek for “union”) is used almost as often as “AEK” by fans and the media alike. In UEFA competitions, the name of the city, Athens, is often added next to “AEK”, to differentiate the Greek club from Cypriot side AEK Larnaca. The “Yellow and Whites”, as they are also called, are the third most decorated club in Greece, after Piraeus-based Olympiacos, and city rivals Panathinaikos. The games against these two teams, as well as PAOK, are the biggest one every season for AEK (as well as for the other three clubs). AEK had been playing at their iconic “Nikos Goumas Stadium” for over 70 years, until its demolition in 2003. Named after a former club president who had been crucial in having it built and then upgraded, the stadium was more often called “Nea Filadelfia”, after the name of the area where it lied. Nea (new) Filadelfia was a big part of the Greek refugees settled back in 1922. Sadly for countless AEK fans who considered the stadium as their second home, it was taken down in 2003, with the club having been given the promise of having a new one built either at the same spot, or somewhere else. That promise was not kept by those in power, and AEK were forced to spend many following years playing as hosts in Athen's Olympic Stadium, which never felt home to the team and the fans. AEK won their first championship titles just before Greece got involved in World War II, and then three more from 1963 to 1971 with players like Kostas Nestoridis and Mimis Papaioannou, “sacred” names in the club's history. The latter has played more games and scored more goals for AEK than any other player, and in his heyday he had been a target of almighty Real Madrid. AEK refused to let him go, and he stayed with them until 1980, for 18 whole years. As for Nestoridis, the fact that he was the top scorer of the Greek league a record five consecutive years, speaks volumes of his magnitude as a player, and is definitely considered one of AEK's five biggest figures of all times. AEK won back-to-back championship titles in 1978 and 1979, with Thomas Mavros and Dušan Bajević forming an almost impossible to stop attacking duet. Bajević, born in Mostar, in what used to be Yugoslavia (later independent Bosnia and Herzegovina), returned to “Enosi” in 1988 as a coach, and he was meant to create a team that played some of the best football the Greek fans have ever seen. On his first season, 1988–89, AEK won the championship, which they repeated three more times under their former striker, with back-to-back triumphs from 1992 to 1994. At the same time, AEK produced some memorable displays and results against true European giants in the UEFA Champions League. Not that they were strangers to European successes; in 1969 they had reached the quarterfinals of the European Cup (later rebranded and renamed as the UEFA Champions League), and in 1977 they went further than in any other season making it to the semifinals of the UEFA Cup (Europa League). The club remained highly competitive even after Bajević's departure in 1996 (to coach Olympiacos, something that some AEK fans never forgave him), reaching the quarterfinals of the UEFA Cup Winners' Cup in back-to-back seasons in the late 90s. With Olympiacos turning into a football empire in Greece in the late 90s, and AEK being left without a home of their own in 2003, the club spent many years struggling for success. Their lowest point came in 2013, when they got relegated for the first time in their history. Businessman Dimitris Melissanidis, a key figure in AEK's successes in previous times, accepted the challenge to lead the club back to where they historically belong, and he did just that. At the same, he made the construction of a new stadium his top priority, knowing that a proper modern home was what the club needed most of all. AEK's double-headed eagle is a symbol of the Byzantine Empire. Constantinople, today's Istanbul, was the capital city of the vast empire, and is also the birth place of AEK's founders, hence the choice of the Byzantine symbol. AEK's logo has been subject to several changes, the biggest of all being that of 1982, when a single eagle design was adopted for all uses. Up until then, different versions of the eagle could be seen in official documents, match shirts, official and unofficial merchandise, etc.